At this time of economic turmoil it can be difficult to perceive for oneself how the principle of sharing is a solution to world problems, and this is especially true for many intellectuals. There are libraries of books and reports that analyse what is wrong with society, the majority of which are trying to reach the impossible – which is to propose new ideas and alternative policies to the government. A government that represents and upholds the disastrous commercialisation of our political, economic and social structures. The more intellectual and thorough our analysis, the more we become entangled in an endless examination of commercialisation and its grievous effects. We find there is no end to its web of complexity. Yet there is nothing theoretical or academic about the family that doesn’t have enough food to eat, that cannot afford to see a doctor, that has no right in some countries even to debate or protest. The more we write and intellectualise, the more we criticise and contest, the more insoluble become the many crises of the world. But if further analysis is not the answer, if no book holds the solution, then what should we do? We cannot create a better world by waging a war against the forces of commercialisation, or by trying to fight against the powers that uphold the current economic system. We have gone too far now within a society led by unbridled market forces, and the interlocking crises of our civilisation leave no time for incremental reforms. The relatively few individuals and groups who do enormous work to confront these systemic issues are now fighting a lost war, so long as a vast number of ordinary people are not rallying behind them. Nor will small breakaway communities ever be strong enough to reverse the current trajectory towards global catastrophe; the concentration of wealth and economic power into the hands of a few has become too extreme to allow a wholesale change in direction. The one solution that remains is to unite the people of goodwill throughout the world, which is our last hope for social transformation on a planetary scale. Because as soon as people come together in a worldwide wave of peaceful protest, the principle of sharing will manifest naturally and automatically. Without this vital missing factor in contemporary world affairs, there is no other way out of the critical impasse that faces humanity in the years ahead. Sharing is inherent in every person and integral to who we are as human beings, whereas the profit-oriented values of commerce are not a part of our innate spiritual nature. The individualistic pursuit of wealth and power results from our conditioning since childhood, nurtured through our wrong education and worshipping of success and achievement. But you cannot condition someone to cooperate and share, you can only remind them of who they are. It is like the baby greyhound who instinctively runs – he doesn’t have to be taught because it is in his genes, he will behave exactly like his mother. In the same way humanity has sharing in the genes, not an inherent predisposition towards self-interest and competition. The greed and indifference that defines our societies has been implanted and conditioned within us, generation after generation. Before a child goes to school, however, they naturally express love and sharing in their personality. This is why we have to unite the people of goodwill throughout the world in order to change society for the benefit of everyone, because then we will recognise each other and instinctually remember who we are. The forces of commercialisation can never prevail or annihilate sharing completely unless they destroy the whole of humanity, because sharing will always remain in our DNA. The only solution, the silver bullet, is the amazing power of the people united. Many recent popular uprisings have given us an insight into the remarkable potential of massed goodwill, but even these movements have represented only a small fraction of the world population. Much, much more of humanity has to come together without any traces of ‘isms’, without any political party leadership, and with the youth leading the way. All the demonstrations we have seen already were not enough: we need hundreds and hundreds of millions of people in the streets worldwide, like a planetary Occupy encampment that continues day after day – which can and must be achieved with the greatest possible urgency. Just as the politician doesn’t like it when people demonstrate because then they are threatened with losing their power and privileges, commercialisation doesn’t like it either when people unite around the world. It knows that when people power becomes planetary, the very structures that maintain its control over society will begin to shake. And because commercialisation is structured by laws and policies, countless economic arrangements will have to be transformed as a new society gradually emerges. Over time the entire organisation of the global economy will have to be reimagined and simplified, until commercialisation finally abdicates its reign over the consciousness of humanity. No other solution will work until the people of goodwill throughout the world rise up in unison together. When millions upon millions of people gather in protest from nation to nation, there is an unconscious to conscious realisation that we are one humanity. Then the principle of sharing will start to be manifested and expressed worldwide, in its many and varied ways. Then we can see that all the perceived differences between people are so pointless, so unnecessary. And then we can see what sharing means in action; that we don’t need this, we don’t need that, we just need you and I. People together. And that brings joy, enormous joy. Before long we may also see how sharing is like a Prozac for world depression, because in everybody there is good, a goodness that is often not expressed. When we begin to express that goodwill between each other, we feel better. We feel dignified. It gives us strength, and it gives us vision. And that is exactly what we are beginning to experience now, amidst the death and rebirth of modern society. Because the death of a society happens when that society is divided, when its people become less and less joyful, free and creative. Millions of people around the world are calling consciously for justice, but what we are actually seeing in all these demonstrations is an unconscious call for sharing. The reason we do not recognise this en masse is because of the many divisions wrought into society by commercialisation and factional politics, fostering so much conflict through ideologies and beliefs, as well as so much complacency. Those who are moved by the inequities in society are almost compelled to engage in a battle against the system, in a fight for justice. But if we could see that only sharing can bring about that justice, then we would pursue justice in a different way through a unified call across the world for sharing. When the heart is opened with love, it can only ever call for sharing. The heart will never go ‘against’ the system, only the contents of the mind can engage in such a struggle for justice in our societies. The millions of people who shout for justice ‘against’ the system are standing for a better world in relation to their maturity, sincerity and intelligence. It requires maturity to protest for changes to the system, because when you are mature then you are responsible. And when you are responsible in relation to the many problems within our societies, then you are left with no choice but to fight for justice, because commercialisation has structured injustice into the system in such an architectural way. But when the heart and love comes with that maturity and intelligence, then the call for justice will reverse its coin and become sharing. We are so conditioned by the system and its ideologies that we miss, by only a fraction, this experiential understanding of sharing as the means of achieving justice. What we are in fact witnessing around the world in so many mass demonstrations is the vibration of the presence of sharing within the human heart, which the youth in particular are beginning to sense, to the point where it is becoming almost palpable. The revolution in Tahrir Square in early 2011, for example, beautifully expressed the vibration of sharing as a divine principle among thousands of people with different backgrounds and beliefs. It was a beautiful sight because sharing, as represented by the power of ordinary people coming together without any isms or ideologies, will always bring beauty and joy. But what will happen to the activist today who intuitively perceives the simple truth that sharing is the means par excellence for achieving justice, and for ensuring the continuation of justice in perpetuity? Unfortunately, we have become so hypnotised by the need for justice in our societies that the one who stands in the street and calls for sharing is a very lonely individual. Amidst the deafening cry in every country for accountability and justice, how could anyone explain the overall vision of what they have felt and understood? It is the equivalent of saying that you have seen a flying saucer. Carry on talking about such a revelation and you can be sure that you will be advised to see a doctor in the end. Only through a worldwide burst of compassion can the principle of sharing be gradually sustained in our societies on the basis of justice, hence the rise of a united voice of the people is of paramount importance. Only through compassion, freedom, common sense and vision can the world’s people come together with one voice, pointing in the same direction without different factions going left or right. Communism and socialism attempted to bring people together on the basis of sharing, but both of these ideologies failed in practice by infringing human free will. So how can the principle of sharing make it alone, without any political ideologies and without taking away our freedom? Only through a worldwide burst of compassion, like a flowing river from the sea that is dammed behind a wall, until the water finally breaks through. And what will such an outburst of compassion mean, in practical terms and on the basis of sharing? It will mean the beginning of the end of hunger. It will mean that the call of the people to end hunger is so urgent, so engulfing, that starvation on this earth will never be allowed to happen again. It will mean that a huge boat sets sail for new horizons, upon which the poor will travel first class. Not everyone will get on the boat to begin with, no doubt there will always be those who choose to remain the children of commercialisation. But when millions of people from different nations come together, peacefully and without political argument, the governments of the world will not know what to do. They will be left with no choice but to join in, until an emergency programme is instituted between nations to end hunger and extreme deprivation, once and for all. The hearts of the youth are already beginning to engage in the peaceful and creative revolution that sharing can bring about. We might say that the hearts of humanity are becoming slowly awakened, although it is really a freeing of the heart that is taking place – a freeing from the stress and the effects of isms and commercialisation. As far as commercialisation is concerned, it finds it very suitable that the hearts of humanity are frozen by mind conditioning. But when the public is sharing simultaneously from the heart, when millions of people are moving on the streets for an end to hunger and poverty, there will be no doubt that a heart awakening throughout humanity is taking place. Perhaps then we will no longer see a division between the ‘activist’ and the rest of society, with the tourist passing by, licking ice cream, while protesters mass around the city squares. Perhaps then, with millions of people around the world calling for sharing in constant demonstrations, countless men and women who have never demonstrated before will get involved too. Perhaps only then, through the many people of goodwill who serve in positions of authority, will we begin to see the dissolving of the laws and policies that uphold commercialisation and prevent sharing. A true revolution cannot be based on ideologies and beliefs, but only on a recognition of the attributes of the heart fused with reason. 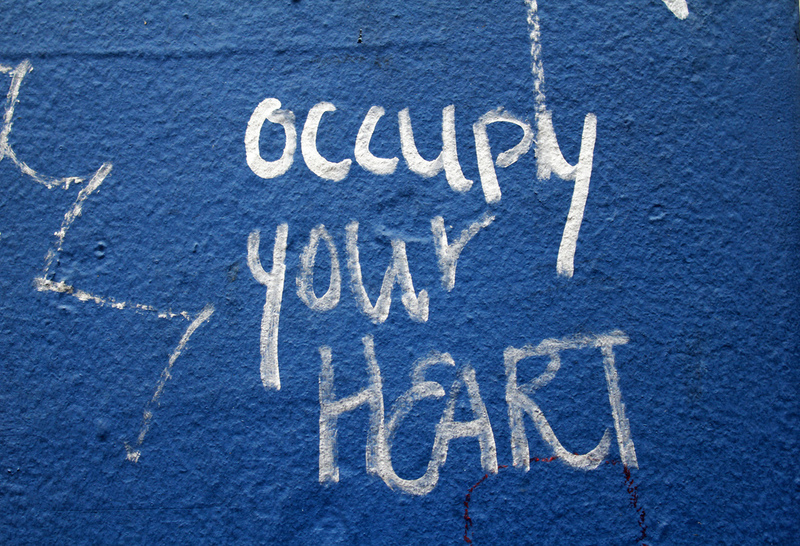 The revolutions in the Middle East throughout 2011 were instantly recognised by each other, for example, and soon copied around the world based upon the reasoning of the heart. And when the heart and mind is fused within a vast group of people it can result in an explosion of joy, as if the soul of every individual tries to dance among the crowds. The public officials in ties and business suits may decry these spontaneous uprisings as leaderless or unstructured, but they do not understand that the heart expresses itself inclusively and without structure by its nature. This is where we can observe the acute differences in worldview between the old consciousness and the new. And this is why it is imperative that we listen to and side with the voices of the youth, wherever they can be found with their banners and tents sleeping in the middle of city squares. A youth that is asking for freedom from all the isms that symbolise the past. A youth that is born equipped to envision the one humanity without any limiting ideologies and beliefs, where complacency is transmuted into right action that is free from fear. Indeed a youth that should be considered a great ally to the principle of sharing, because commercialisation hates the unconditioned minds that threaten its stranglehold on society, while the conservative powers in governments fear the idealistic youth who threaten to batter down their isms. We may think that the youth of today are somehow special or unique in how they express a newfound dynamism and energy, but remember that the youth have always been this way – the only difference is that now their time has come as the old structures are falling apart, and a new world is slowly being born. This is the definitive moment in history that the youth have awaited for many thousands of years. Now is the time for every young person to come together and demonstrate across the world, determinedly refusing to conform to a society that offers them no voice or even hope. They should also seize upon Article 25 of the Universal Declaration of Human Rights, and reclaim its stipulations as a law of the will of the people. Right now that sacrosanct Declaration is lying dormant, and it should be resurrected by the public to whom it has always belonged. Most especially it should become the Declaration of the youth, for they are the ones who can take it back into the public arena of the world. Any revolution needs a slogan, and the true revolutions of today should adopt Article 25 as their all-inclusive motto, goal and vision. It is then up to governments to structure the visionary aspirations of the youth, and render this presiding law of the people into the law of nations. First of all, a united voice of the public has to clear all the reactionary forces from governments, and then put into seats of power wise, ordinary men and women who are tuned with the people’s voice, who are moving with the public’s demonstrations, and who are speaking on behalf of all the human race. This fresh blood in governments will know precisely how to give structure to the public’s demands for justice and freedom, and will make sure that the visionary aspirations of the youth are guided along the right path. In the end, we might say that the principle of sharing will implement itself in our societies through the common sense that arises when heart and mind are fused together. When the heart is engaged, when common sense informs our decisions, then order and structure will come about like we have never seen before. This process must begin with an uprising in every country of the world, with a concerted call from the public for sharing that is received by government leaders, and then implemented in economic and social policies from the top level down. The logistics of sharing resources must start from above and spread below, from the nation level downwards to the public, which will represent the beginning of right relationship between people and their governments. After all, it is the state that holds the keys to a nation’s resources, including the billions of dollars that are usurped by the military and other harmful spending priorities, or the millions of tonnes of food that are continuously wasted and left rotting in vast storehouses. Whereas an effectual process of economic sharing cannot be institutionalised on a national or global basis if it remains limited to the level of the public, such as through mass community actions or charitable endeavours. In this regard, the implementation of sharing within our societies should not be confused with giving up personal possessions or wealth, which is tantamount to a form of theft if forcibly imposed on the public by government decrees from above. We will only behold the art of sharing as an economic principle when governments fundamentally reorder their distorted priorities to favour the greatest need among all citizens, and ultimately share the nation’s surplus produce for the benefit of humanity as a whole. This does not mean that governments must purposefully enact policies based on a singular interpretation of sharing, as a fairer distribution of resources can be brought about in a multitude of different ways. One nation may also begin cooperating with another nation in response to financial crises or out of economic necessity, but without acknowledging the word ‘sharing’ in their governmental policies. However there is no prospect of genuinely sharing global resources until each nation learns what it needs and produces in surplus, and then enshrines that understanding in entirely reformed political and economic arrangements on both a countrywide and international level. Sooner or later, therefore, it is foreseeable that resource sharing will have to be studied by elected leaders in a deliberate and planned manner, and with the full support and backing of all their constituents. The systematisation of sharing as a global process may not be anything like a romantic or sentimental notion of generosity and world goodwill, as it is rather an enormous logistical undertaking that will require the most experienced representatives of every country to coordinate and plan. We can imagine the principle of sharing as a trusted advisor whom every policymaker must keep by their side at all times, with the needs of the poorest and most excluded always guiding the thinking behind every decision. In time, the new order and structure that is brought about in different countries will call, step by step, for governments to meet at the United Nations and discuss cooperative solutions for world problems in line with the principle of sharing, thereby signalling the commencement of truly democratic governance on behalf of the common good of all. In light of the dramatic changes that lie ahead, any person who perceives sharing as an answer to converging crises should think carefully about the meaning of redistribution. This term has very evasive and controversial connotations, and can breed tension, stress and even violence if promoted in the wrong context. There is a healthy meaning of redistribution which is a result of right sharing, such as to redistribute a tonne of tomatoes from one region to another based on a system of fair and mutual exchange. But there is another meaning of redistribution, which entails forcing the rich people in society to surrender their personal possessions or wealth. That is exactly what communism tried to do, and it may inevitably involve a violent infringement of human free will. If a government really wants to share the nation’s resources it should start by dismantling the machinery of war, otherwise the finances procured by raiding the coffers of the rich are more likely to end up back in the military budget than with the poorest in society, thus supporting further warfare and reinforcing the status quo. Why weren’t the richest people and corporations taxed sufficiently in the first place? Where does the money go once they are taxed, to social needs or perverse subsidies? And why were they given so much opportunity for amassing their enormous fortunes, while the government was playing games with market forces and commercialisation? It was the system that allowed the wealthy to go so far in enriching themselves, and now the disciples of the same system try to coerce the rich people into redistributing their wealth. This is an old and divisive tactic born of the factious ways of the past. Communism tried, socialism tried, and now even capitalism has joined the club. It may please the populists who blame the rich for all of society’s problems, but it will never bring a solution to social injustice as long as the system itself is based on the interests of privilege and wealth. The surest way to bring about a reversal of extreme inequality is for a bulk of humanity to demonstrate on the streets, unceasingly through day and night, and with the vision of a united world to demand: ‘Enough of bailing out the banks, enough of austerity that doesn’t end, enough of aimlessly trying to tax the rich – it’s time to bail out the poor for a change through economic policies based on sharing, justice and common sense’. It is imperative that we look at these issues for ourselves with introspection and self-awareness, and no longer define our identities in terms of what we are against, such as capitalism or the rich. Hence the implementation of sharing on the basis of justice must begin with a transformation in human consciousness led by our maturity and the reasoning of the heart. That is when a new understanding of sharing may arise in our minds, which may change our whole attitude to wealth and redistribution. When the nations of the world collectively act to end poverty in its totality, then the word ‘redistribution’ will fall into its right place and begin to assume a different meaning. Then we may begin to think in terms of a ‘just’ or ‘right’ distribution, and we will no longer need to use the word ‘fair’ in relation to global economic arrangements. These are important semantics to reflect upon, because it may help us to intuit what sharing has to achieve in its proper and holistic vision. Right distribution is aligned with right human relationship, but redistribution – even with the utmost good intent – can only arise in a society that is defined by legitimated theft, institutionalised injustice, and the endemic infringement of human free will. Imagine if there were millions of people demonstrating for sharing across the world, then not even the rich would have to think about ‘redistributing’ their wealth. Nobody would need to confiscate their money from them, or coerce them into supporting an emergency programme to redistribute resources to the famished poor. A united voice of the world, all together for sharing and justice, will create such a force in society that people everywhere will follow its trend, including the billionaires. Among the wealthy are good people too, and many will come by themselves voluntarily at such a time and say ‘here it is’. They may not want to forcibly give up their wealth, but they may certainly want to share it once their hearts meld with an overwhelming call from the public to end hunger and poverty. They will not even hear the word ‘redistribution’ if they are standing with the people and sharing their wealth for the cause of upholding social justice. That is the stage we have to reach, which will mark the true revolution that only sharing can bring about. Of course, the fair collection and redistribution of tax revenue is fundamental to just and democratic societies, and when resources are more equitably shared then there can no longer be such extremes of poverty and wealth. But in the creation of such societies we must respect the rich as much as the poor, even if many wealthy people resist the changes that are happening across the world. It may take time, but those people will eventually be left behind by the deafening cry for a new civilisation that is founded upon the principle of sharing. In order to perceive for ourselves the importance of transforming society along these lines, we clearly need to think carefully about how we interpret the meaning of sharing in political and economic terms. For example, the idea that sharing means ‘to feed the hungry’ is, in fact, total nonsense. Who says it’s our food to share with the hungry? Only commercialisation does, with its diabolical cleverness that conditions our minds. What do we mean when we say that this food belongs to us, while some parts of the world have no food at all? How did we get that food in the first place, in a world with a huge surplus of food per capita? To see the morality inside of this question, we will have to enquire into the unjust structural arrangements that have resulted in a world ridden with hunger and deprivation – the importing of food at a cheap price, the decimation of smallholder farming, the long history of theft from and exploitation of the poor, and so on. If we think ‘this is my food, and I am sharing it with the hungry’, it does not acknowledge or resolve the problem. How can we remain indifferent when we are told that people are starving in other countries, and then think that the food on our own plate is rightfully ours? If we are straight and honest with ourselves, we will never think that this is our food to share. We will say: ‘The food in the world belongs to everyone, therefore I want my government to change its attitude towards poverty in order to end it’. The meaning of sharing is not ‘to feed the hungry’, but to irrevocably end poverty through implementing justice. Sadly, in the divided world of today where feeding the hungry is a matter of international responsibility born of emergency, an end to life-threatening poverty can only be brought about through a united voice of the people of the world. The principle of sharing also has a tough side to its nature that is profoundly allergic to such words as charity, philanthropy and even altruism – words that have suited our collective complacency for millennia. Indeed, what is a philanthropist if not a ‘somebody’ with an ambitious and competitive mind who became rich by learning how to profit from an exploitative and unjust system? For how did the philanthropist make that money, however well-intentioned and altruistic their charitable activities? As always it begins with discovering a talent for manipulating the system, or by inheriting wealth that is the product of a system based upon exploitation. How else can the executives of large corporations be given millions of dollars in salary, bonuses and severance pay, while the army of workers who keep the business running are paid the minimum wage according to the law, often in overseas countries that offer no worker benefits at all. Then the philanthropist, in order to expand his image and reputation or salve his conscience, decides to give some money back to charity. He doesn’t ask the workers what should be done with that money. In effect, he makes money off the backs of the workers and gives a small portion of it away, at their expense. We should ask ourselves: how can there be so much opportunity for making billions of dollars through commercialisation, when hundreds of millions of people are at risk of dying from hunger in other parts of the world? We always see the person who is making billions start to rub shoulders with the politician, and vice versa, but we never see the politician rubbing shoulders with the person dying from hunger. If the dictionary were to give an appropriately moral definition of the word charity, it would state: ‘an undignified act that results from complacency’. It is undignified because we can always do something to help achieve justice, but owing to our complacency we find it more convenient to give some crumbs to the needy. And once we give enough money to charitable causes, the establishment will eventually reward us in an honours list and give us a title. Obviously no-one should advocate for an abolition of charity, which is a venerable necessity in our society when millions of people subsist in a state of dire poverty and desperation. Our hearts are essentially benevolent and caring, which is why we believe in giving to charity when we hear of humanitarian emergencies in distant countries. But why do such emergencies of Biblical proportions keep repeating themselves again and again, despite all the know-how and ingenuity of humanity? Because we are also complacent, and we often give without even thinking about justice. We do not collectively demand that our governments stop these preventable emergencies once and for all, whatever their cause. When we give to charity without thinking about justice, then the act of donating has nothing to do with sharing the resources of the world. If sharing and charity were personified and met each other on the street, sharing would say to charity: ‘Who are you? I do not believe we have met before’. The very existence of charity in a world of plenty symbolises the divide that exists between the rich and the poor, the haves and the have-nots. To be sure, if governments implemented the principle of sharing on a global basis it would signify the end of days for charitable giving. There is enough food in the world to feed everyone, enough resources to provide healthcare and housing for all, enough knowledge and technology to empower even the poorest country to meet its needs. No matter how much of the world’s resources we collectively share with the people living in abject poverty, there will still be more than enough to satisfy the basic needs of all. How did the affluent countries accumulate so much resources and industry in the first place? How much of the food, fuel, minerals and land in the world have we appropriated from the people of less industrialised countries? These are the questions we need to ask if we want to perceive for ourselves the simple logic of sharing and justice. We should not accept the above propositions unless we have fully investigated for ourselves the meaning and implications of sharing as a solution to the world’s problems. It may seem too idealistic to believe that the key to social transformation lies with the massed goodwill of ordinary people, and that nothing will change unless people power becomes planetary. We may become slightly more aware of the possibility of changing the world situation by thinking of our own complacency, but if something inside of us has not confirmed it completely then after a few minutes we may quickly forget and revert back to our old conditioning. We are so influenced by our environment and bombarded by the thoughts of others that it requires a certain courage, determination and perseverance to think freely and to know oneself. We are all part of the process of commercialisation, and we are all ultimately responsible for its pernicious conditioning within our societies. Once the way of sharing is deeply confirmed within us, however, and we understand it with rage, with passion inside, then it will mould our character in such a way that we will never be fooled by commercialisation again. The way of sharing is universal. You and I, let’s be together. Let’s share. It’s as simple as that, and forever will be. Intellectual theories about social change will mean nothing unless the people rise up, pushing out the old order and heralding the new. That is where the real meaning of our lives begins, and where true power resides. We may think of the powerful as those who lead huge multinational companies, who have the capital needed to raze the Amazon rainforest, who have such control over resources that they can take over people’s lives. But in spiritual terms that is not power at all, it is completely the reverse. True power is togetherness and sharing among millions of people, which is unifying, creative and healing on a worldwide scale. Unlike the very wealthy who live only for themselves, true power in an individual sense is non-divisive and non-destructive, and rather distinguished by humility, inclusivity, harmlessness and detachment. From a planetary or group perspective, it represents everything that brings about justice in society and equilibrium within the environment, and gives energy back to creation as it is. When all the nations come together and share the resources of the world, when humanity brings about balance in consciousness and in nature – that is power in the truest sense. All the so-called powerful people in our present-day society are sustained only by commerce, by laws, by ideologies and beliefs. But when we no longer bow to their authority and come together as one, then we will see what power really is. To repeat a slogan often written on protest placards: why are we frightened when they are so few, and we are so many?